Often, people are curious about all the vibrato they hear from opera singers. Compared to the way most pop singers use their voices, vibrato can seem like an effect, superimposed by the singer in an active way, to achieve that “opera singer sound”. In reality, vibrato is the result of the ultra-efficient, healthy sound that opera singer work to achieve. Vibrato is a great litmus test, one that reveals what’s happening in the mysterious and subtle vocal mechanism. Opera isn’t all about singing with a constantly vibrating tone, but when a singer maintains the potential to vibrate any note, it means that they’re singing with breath support and a relaxed body. There are a few instances where singers can really use this vibrato-as-litmus-test phenomenon. The examples are likely endless, but we’ve narrowed down a few sections from beloved arias, where attention to vibrato can keep the singing easy, and the singer honest. Similar moments are in all of these falling phrases later in the aria (shown below). 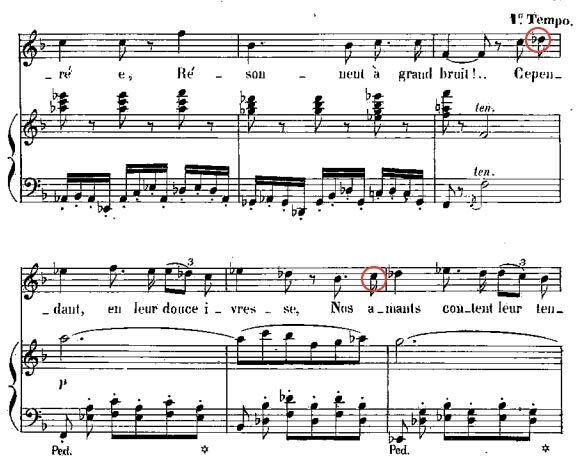 Coming down from the A-flat on “te revoir” is about more than nailing the high note; listeners respond to the full outburst of this phrase, and the best words are not on the high A-flat. The tension is really in the G-flat that immediately follows. Plus, tenors, you’ve got to do this again in the next line. 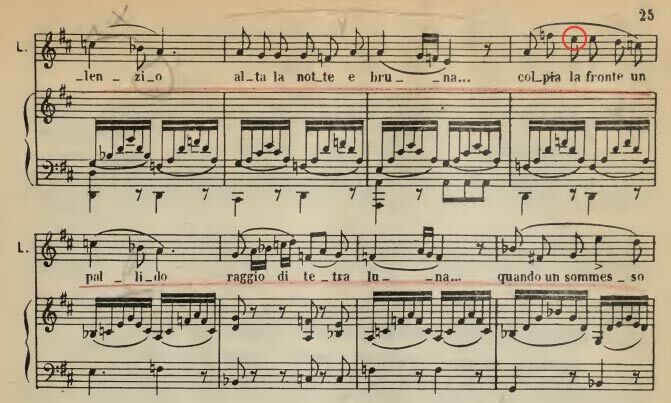 The bottom system of this excerpt shows a sequential pattern of descending phrases; each time, it’s the first note down from the highest peak that matters. The words aren’t necessarily the most imporant, but vibrating beyond the high notes will let you do what you want with those diminuendos, and it will keep the “tu n’avais eu qu’à paraìtre” from feeling pinched or unsupported. 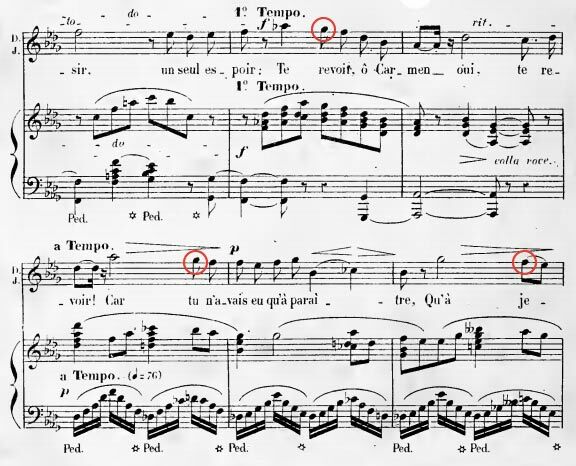 The circled note on “tourterelle”, right before the scales up and down, serve the voice in the same way stretching serves a runner. 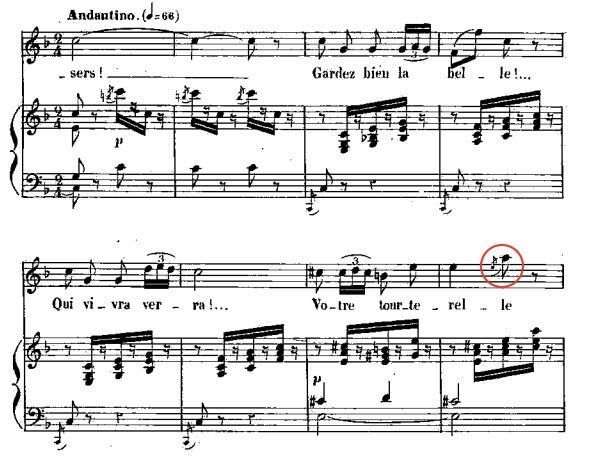 It’s understandable that the singer’s attention is on the moving notes; yet without a supported, easy, malleable starting note on “-rel-”, it’s hard to get moving at all. Pay attention to the vowel you choose for this C-natural, and use the vibrato to avoid “falling” down from the D-natural just before it. This phrase is all about being up, so give yourself a fair chance with an energized start. This excerpt is from Lucia di Lammermoor’s first aria, “Regnava nel silenzio”. 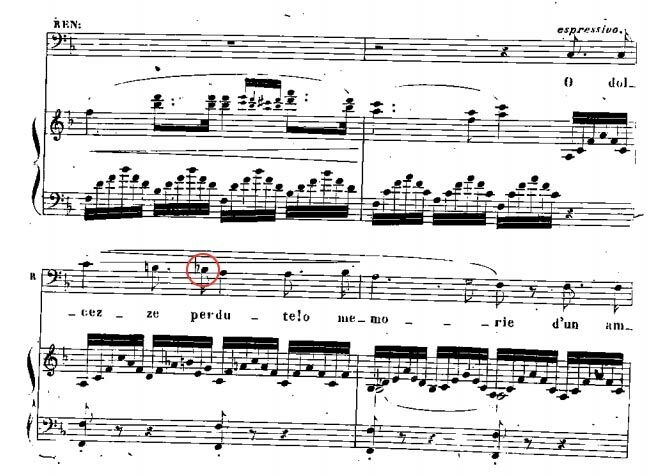 The first two phrases have that tragic, minor sixth leap up from A to F-natural; in both cases, it’s a common trap to neglect the first E-natural that follows (circled). It has to do with the text (“la” isn’t important per se), and the 6⁄8 meter (weak beats like this first E-natural can get lost in the meter’s natural lilt). Imagine these two repeated E’s as one longer note, rather than two short. Pay attention to what your vibrato is doing on the word “la”; it will help you sing through the consonants in “fronte”, and stay beautifully in tune. This descending semitone is another tiny one. This small cadenza is a complicated bar, and like the Gounod exceprt above, it’s easy to focus on individual difficulties. Once you’re happy with the high F on “o”, carry that spin, height, and vibrato down to the D on “spe-”. Sections like this are like a ladder, and dismissing quick passing notes can be like removing rungs from said ladder. Maintaining vibrato (even potential vibrato) on the circled D will keep you in shape for the rest of the measure, specifically the second D with the fermata. Instead of falling out of your extreme register, you’ll make a calculated descent with the option of ascending again. Singers, we want your input! What does vibrato do for you, and when does it matter most? Let us know in the comments below.